On one sheet, these summaries distill the key “take home” messages for each of the category guides, and provide an overview of the full chapter guidance. We expect them to be very useful to sustainable purchasing program leaders and champions as they prepare to engage buyers, budget holders, suppliers, and other category stakeholders. Members can access the summaries in the Resource Center of the online member community. The Guidance is hosted within the Resources section of SPLC’s online member community. Anyone with an email address administered by a member organization can self-register for an account. We plan to make excerpts available to non-members in the future. In the meantime, several resources are public, such as SPLC’s Principles for Leadership in Sustainable Purchasing, Key Factors and Solution Strategies Worksheets, and Sustainability Spend Analysis Tool Provider Tables. Use SPLC’s Guidance for Leadership in Sustainable Purchasing to help your organization understand and optimize the environmental, social, and economic performance of its purchasing. The Guidance contains two types of guidance: (1) program design guidance for organizations looking to build a strategic and leadership-capable Sustainable Purchasing Program, and (2) category guidance for those seeking to address key impacts and opportunities in specific areas of purchasing. and benchmark progress toward goals. The Guidance is a voluntary program that will serve as the basis for a benchmarking survey in 2016 and a rating system that rewards organizations for demonstrating leadership in sustainable purchasing, which will be piloted in 2017. What’s new in Guidance v2.0? Guidance v2.0 includes revisions to all Chapters of Guidance v1.0 but additional revisions of Chapters 2 and 3 are planned for the second half of 2016 (e.g., increased policy guidance, more spend analysis improvements, more case studies, etc). SPLC’s Guidance for Leadership in Sustainable Purchasing is intended as a comprehensive handbook for organizations seeking to exercise leadership in sustainable purchasing. Because not all organizations will be starting from the same place, the Guidance supports organizations to iteratively grow their sustainable purchasing efforts into a comprehensive Sustainable Purchasing Program that enables the organization to take meaningful responsibility for all significant environmental, social, and economic consequences of its spending. Only by doing that, can an organization demonstrate genuine leadership. 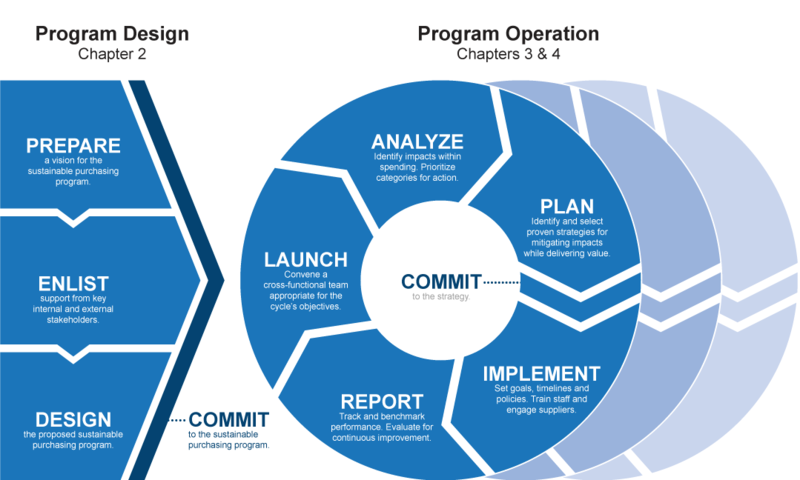 The Guidance is organized in four chapters, which together provide a framework for the cross-functional collaboration necessary to build a strategic and leadership-capable Sustainable Purchasing Program. Provides an overview of sustainable purchasing and the strategic opportunity that it represents. Helps sustainable purchasing “champions” build strategic and leadership-capable Sustainable Purchasing Programs within their organizations. Describes a continuous improvement process that cross-functional teams can employ to develop effective strategies to achieving specific environmental, social, and economic performance goals.